Hostel Polako i Trebinje, Bosnia og Herzegovina: Bestill nå! Welcome to our FIFTH YEAR of business! Run by two backpackers, Hostel Polako is the place to be if you like to hang back and take in a town's atmosphere. We’re proud to show you why Trebinje has made us decide to never leave. The hostel has tons of places to chill out in, whether that’s on our big comfy couch in the sunny common room, barbecuing out on the stone terrace, having a chat on the balcony, or playing NINTENDO 64 in our game corner. 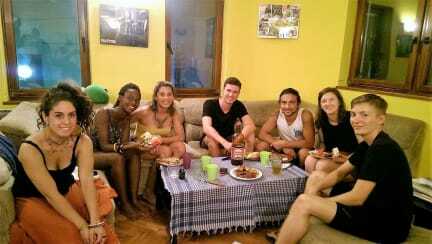 Here at Polako, we know that a hostel is not a cheap hotel or a house with a bunch of rooms—it’s a home for travelers. That means our main priority is to create a social atmosphere where you can meet and hang out with other travelers. We’re proud to run a clean, cozy place that you’ll never want to part with. Fresh, homemade pancake breakfast is included in the price, and we have regular family-style dinners. And, of course, we offer Wi-Fi and free coffee and tea, free bed linens and towels, a fully-equipped kitchen, and a laundry service. If you bring your own car we have free parking, too—as well as gated bike and motorbike parking. Take it easy, go slowly, chill out, no rush…come live the “Polako” style! DAILY BUSES to & from Dubrovnik, Kotor, Mostar, Sarajevo, Belgrade, and more. Cheap Dubrovnik daytrip doable by bus!